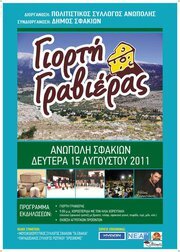 Anopolis' Cultural Assosiation invites you to attend the annual Celebration of Graviera in Anopoli, Sfakia. There will be plenty of Sfakian dishes to choose from while listening to Elias Choreftakis and his band. Ο ΠΟΛΙΤΙΣΤΙΚΟΣ ΣΥΛΛΟΓΟΣ ΑΝΩΠΟΛΗΣ ΣΑΣ ΠΡΟΣΚΑΛΕΙ ΝΑ ΠΑΡΕΥΡΕΘΕΙΤΕ ΣΤΗΝ ΕΤΗΣΙΑ ΕΚΔΗΛΩΣΗ ΓΙΟΡΤΗΣ ΓΡΑΒΙΕΡΑΣ ΣΤΗΝ ΑΝΩΠΟΛΗ ΣΦΑΚΙΩΝ. ΜΕ ΠΛΟΥΣΙΑ ΣΦΑΚΙΑΝΑ ΕΔΕΣΜΑΤΑ.ΘΑ ΣΑΣ ΔΙΑΣΚΕΔΑΣΕΙ ΤΟ ΣΥΓΚΡΟΤΗΜΑ ΤΟΥ ΗΛΙΑ ΧΟΡΕΥΤΑΚΗ.